Fire at workplace and home remains one of the Major disaster with high potentials. With adequate research, testing and implementations, BASSCOMM Nigeria brings you one of the most informative seminar in this age and time. 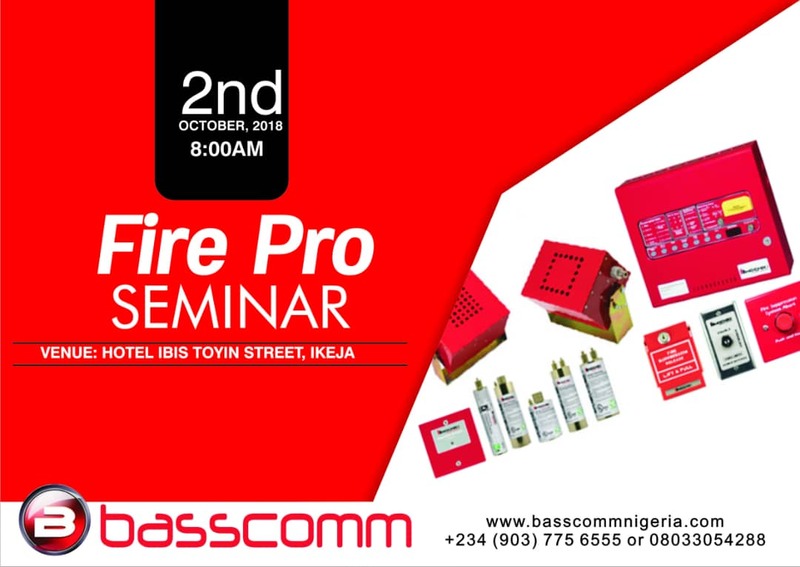 FirePro Seminar is designed for Health, Safety, Security and Environment managers, Facility managers, Engineers and Consultants who seek a fail proof firefighting and security system. BASSCOMM along with FirePro team will provide all the basic and technical information and solutions while also supporting clients both in the installation and maintenance processes of the system. FirePro Systems requirements – system architectural design. FirePro system components & functions. Demo installation of FirePro Condensed Aerosol generators and systems. FirePro Aerosol generator certifications – FirePro Electronic certifications, FirePro Product certifications, FirePro environmental certifications, FirePro Marine certifications. Soft copies of Seminar manuals and slides.